This emblem, which was approved before 1961, combines the red and white colours of Canada with the blue of waterways. The maple leaf evokes Canada and the dolphins represent the ships that ply the coasts of Canada. As well, dolphins are regarded as ancient talismans and helpers of all mariners. The crown represents service to the Sovereign. Meaning “Safety first, service always”, the motto expresses the Coast Guard philosophy. 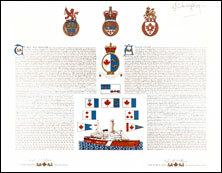 The announcement of the Letters Patent was made on July 25, 1992, in Volume 126, page 2304 of the Canada Gazette. 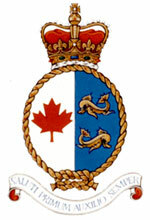 Original concept of the Canadian Coast Guard and Robert D. Watt, Chief Herald of Canada, assisted by the heralds of the Canadian Heraldic Authority.